There’s no tax-reform bill yet, only a framework, but the left is already trumpeting the old argument that Republicans want to help their rich buddies while blowing up the deficit. It’s déjà vu all over again: We’ve heard this from Democrats since the fights over the Reagan tax cuts in the 1980s. The initial jousting has concerned dynamic scoring: How much lost tax revenue from lower rates will be offset by greater economic growth? Democrats say the plan will bring in little or no additional revenue from faster GDP growth. Republicans say the final bill, once written, will add more revenue than one might expect. At least Rep. Kevin Brady, chairman of the House Ways and Means Committee, has a sense of humor. Democrats are “kind of selective about dynamic scoring,” he told Brian Kilmeade on Fox News Radio. Mr. Brady explained that Democrats say allowing “Dreamers” to remain in the U.S. under Deferred Action for Childhood Arrivals would boost economic growth. They’re right, but similar math applies to tax reform. Controversy over dynamic scoring will continue in the months ahead because two big players in this discussion, the Congressional Budget Office and the Joint Tax Committee, have a bias against it. In their view, tax cuts reduce revenue, which increases deficits, which causes higher interest rates, which crowds out private investment, which leads to slower growth, which results in even more lost tax revenue. The Tax Foundation has a more expansive view, believing there is enough global saving that some amount of deficit won’t drive up interest rates and thereby slow growth. Some tax cuts, the foundation recognizes, generate higher economic growth. This produces new tax revenue that offsets at least some of the revenue—and occasionally all of it—lost from lower rates. Mr. Brady might think about freshening up his line on dynamic scoring by adding an explanation of how liberals are duplicitous about deficits. Democrats have no compunction about bigger deficits caused by domestic spending, which rarely leads to a durable increase in economic growth. 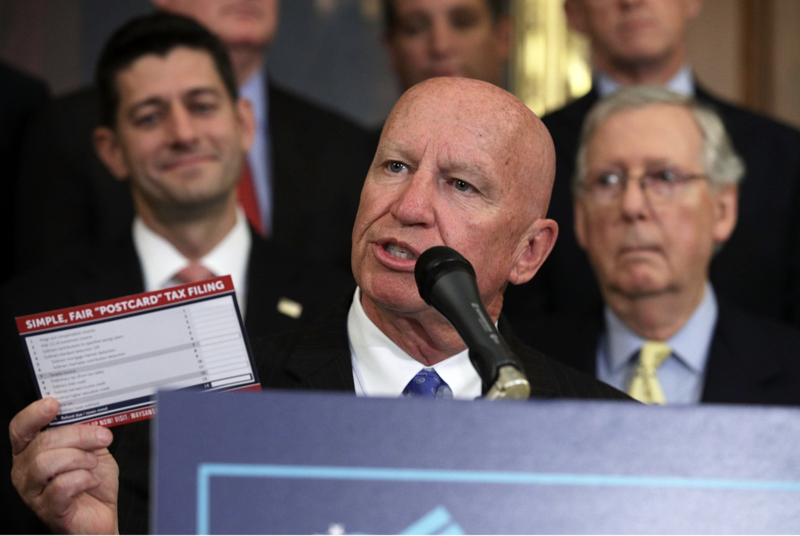 The challenge facing Republicans in this debate is what the Tax Foundation’s president, Scott Hodge, calls “the paradox of tax reform.” The popular items—middle-class tax cuts, a bigger child tax credit, an increased standard deduction—tend not to add as much growth. The provisions that juice the economy are the more arcane items, like lowering corporate tax rates and ending double taxation of American companies’ foreign profits. An Oct. 1 poll by Morning Consult shows that 48% of voters support Mr. Trump’s overall tax-reform framework, compared with 37% who don’t. Still, Republicans will be making a mistake if they are more concerned about the popularity of individual provisions than about their power to improve growth. Going into the 2018 midterm elections, the GOP needs a strong economy, more jobs, bigger paychecks, increased optimism. A tax-reform package of largely popular items with minimal effect on growth will not produce those tangible advantages. A Sept. 10 Gallup poll found only 36% of Americans had a positive view of the Republican Party, while 44% had a positive view of the Democratic Party. Yet 46% said the GOP “will do a better job of keeping the U.S. prosperous,” compared with 42% for Democrats. Republicans can build on that trend by making not only the economic case for tax reform but the moral case as well. There should be a limit to how much Washington takes from any American. Money that is lawfully earned belongs to people who made it by the sweat of their brows, not to the government. In 2009, a Tax Foundation survey asked: “What is the maximum percentage of a person’s income that should go to taxes—that is, all taxes, state, federal and local?” The average answer was 15.6%. That’s well below the true figure. The Tax Foundation estimates that the average American’s total effective tax rate is 31%. The arguments for cutting the corporate tax rate are strong in a different way. Corporate taxes are paid mostly by workers in the form of lower wages and smaller benefits. Some of the tax is passed on to consumers in higher prices. Cutting the corporate tax rate will raise wages. Because the U.S. corporate rate is the highest in the industrialized world, tax reform will also make American companies more competitive in selling to the world. There are no easy political fights these days, and Democrats may score points in the short run by attacking the tax-reform package’s pro-growth elements. Republicans must understand that what really matters is the state of the economy on Election Day 2018. Which means the GOP better get tax reform done.